We return to the West-coast coming Friday. There is a lot I have to look forward to. Kenzo is fit enough. It will be Tilde's first visit. Viva will be there, waiting for us. And this time, also a first, we'll have our own little place to share. Ladies and Gentlemen. In the left corner, weighing 78 pounds, Kenzo! And in the right corner, weighing only 56 pounds ... Tilde! As you could read yesterday, in König The Hovawart Founder Revisited: The Myth Of The Hoffwart, it was the conviction of Max von Stephanitz, to favor function over looks in the breeding of German Shepherd dogs, what appealed to Kurt F. König. König was a diligent breeder of German Shepherd dogs and became a very active member in the local branch of the "Verein für Deutsche Schäferhunde" founded by Max von Stephanitz, in Thale, Germany. During the dark ages, dog breeds as we know them today, weren't established yet. 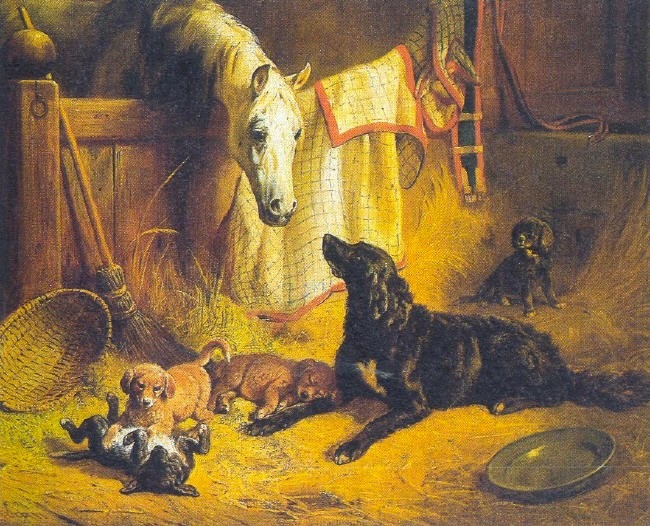 Dogs were kept and bred mainly for their function. And in Germany during that time, one of those types was the "Hoffwart", the farm guard. The alleged predecessor of todays Hovawart. And we received more Hovawart Wizards updates, which make me very happy. This time, it's Hovawart Wizard Susanne. She wanted to share this especially for all those other two-Hovie households out there. Hovawart Wizard Jacque was so kind to send me an update, she wanted me to share. Maybe you remember how Jacque found out her adopted Golden, was actually a Hovawart. Jacque opened her heart and home for a new Hovawart again with Amber, and a while ago asked for advice on the blog through the comment section on getting a second puppy. As you are about to see, Jacque decided to go forward with a second puppy, so let's give a warm welcome to Oggy! Tilde is so happy to meet people. Really happy. When I took her out to walk in a small and not too busy shopping street, her excitement went sky-high. There were so many people to meet. And then they were on the left, and then they were on the right, it was hard for her to keep up, if she hadn't missed and disappointed somebody. "I will show you!" the trainer said, and I handed the leash with Kenzo over to her. She made sure everybody was silent, and took off, wiggling in a way that would make Beyoncé faint, while talking to Kenzo in such a high-pitched voice it made me wonder if she might have been abducted by aliens. Tilde is not very fond of water. All that liquid in one place, it's just so very wet and eeky. It is hard for her to see the fun of it. I remember Mie - the lady of the shelter - told me, it gets better when you go in the water with her. I'll have to keep that in mind for when the water temperatures are better. In the mean time, Kenzo can come to the rescue. Although I am not sure. Is he an excellent swim instructor showing Tilde how to do it? Or is he rather the right bait on the hook to catch Tilde? You tell me. That juicy stick in Kenzo's mouth might have something to do with it too. That is not fair, you are swimming with MY stick! And we are swimming ...! Tilde was one of the last Hovawarts rescued from the Danish Hovawart Puppy Mill. Here is her story, and that of her parents, Cherry and Aapo. It is a sad story, which is why I kept it to myself and a couple of close friends for almost a year, but after adopting Tilde I felt obliged to write it, in honor of her parents Cherry and Aapo. You already guessed it, right? Indeed, Tilde is Kenzo's New Personal Trainer. 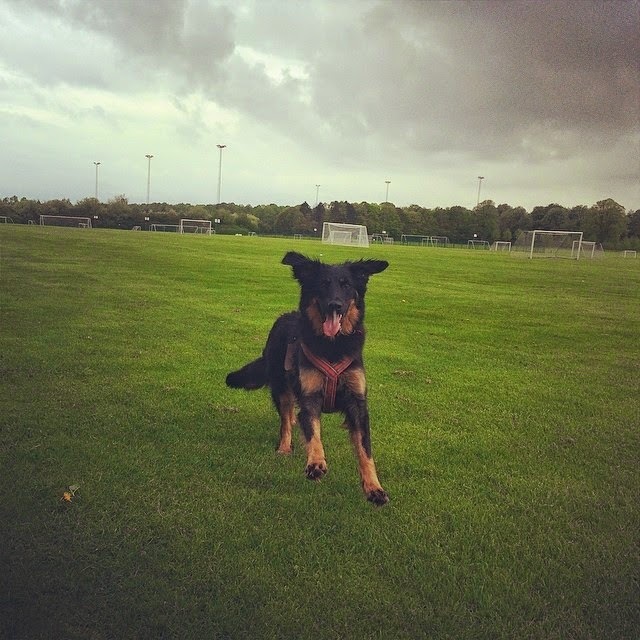 Kenzo is very close to his recovery, we just need a little more muscle and leg awareness before he can go - controlled - off the leash. In Tilde's boot-camp, he is getting just that, with simple and plain old-fashioned play-wrestling. Blond Retriever Or Golden Hovawart? © Kenzo the Hovawart | All rights reserved.